The aim of the journal is to provide a respectful outlet for 'sound science' papers in all research areas on surfaces and interfaces. We define sound science papers as papers that describe new and well-executed research, but that do not necessarily provide brand new insights or are merely a description of research results. The journal aims at being a fast and efficient platform for disseminating scientific results in this wide area of research. Fundamental, interdisciplinary, theoretical, experimental and applied work will be considered. Please note that tribology and bio surfaces and interfaces are not in scope. Articles rejected after peer-review, that do not meet the standards of quality set by the Editors and referees of our sister journals, will be offered to be transferred to Surfaces and Interfaces. During the submission process the authors will be requested to provide the review comments of the rejected manuscript and a revised manuscript where the comments of the previous reviewers have been taken into account. The revised manuscript will then, together with the review reports, be assigned to one of the Editors who can take the final decision: accept/revise/reject. The Editor can at this stage accept the manuscript or send it out to one reviewer. Those reviewers will be asked to check the described scientific procedure and description of the work. But they will not be asked to comment on significance or the topic of the paper. The journal will also accept new submissions that will be directly assigned to an Editor who will manage the peer-review process. But articles submitted to Surfaces and Interfaces that meet the higher standards of quality and novelty set by our sister journals will be transferred to those journals. Note to the authors: Plagiarism, or copying text or results from other sources, is unethical behavior and is not tolerated at Surfaces and Interfaces. 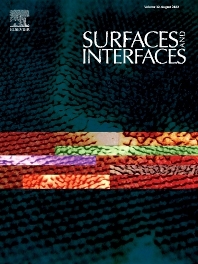 All manuscripts submitted to Surfaces and Interfaces will be checked for originality using the CrossCheck database. For more information on CrossCheck please visit http://www.crossref.org/crosscheck.html.